Kidliterati: Cover Reveal: OMEGA CITY by Diana Peterfreund! Cover Reveal: OMEGA CITY by Diana Peterfreund! Today, we are thrilled to welcome accomplished YA author Diana Peterfreund, author of For Darkness Shows the Stars and Secret Society Girl series, for her middle grade cover reveal of OMEGA CITY! Gillian Seagret doesn't listen to people who say her father's a crackpot. His conspiracy theories about the lost technology of Cold War-era rocket scientist Dr. Aloysius Underberg may have cost him his job and forced the family to move to a cottage in the sticks, but Gillian knows he's right, and plans to prove it. When she discovers a missing page from Dr. Unerberg's diary in her father's mess of an office, she thinks she's found a big piece of the puzzle--a space-themed riddle promising to lead to Dr. Underberg's greatest invention. Enlisting the help of her skeptical younger brother, Eric, her best friend, Savannah, and Howard, their NASA-obsessed schoolmate, Gillian sets off into the ruins of a vast doomsday bunker, deep within the earth. But they aren't alone inside its dark and flooded halls. Now Gillian and her friends must race to explore OMEGA CITY and find the answers they need. For while Gillian wants to save her dad's reputation by bringing Dr. Underberg's secrets to light, there are others who will stop at nothing to make sure they stay buried...forever. Nasa, secrets, and an underground bunker? Sounds pretty awesome, right? Well, judging by the cover, we're in for one wild ride with OMEGA CITY! What do you think? We love the depth in this illustration! From the glowing light to the dials and knobs, there's so much to look at in this image that it really gets us guessing about the story. One of the things I was most excited about when I sold a middle-grade book was getting an illustrated cover. As someone who is hard-pressed to draw so much as a smiley face, I live in awe of people skilled in the visual arts. And when my editor at Balzer + Bray informed me they were hiring the amazing Vivenne To, I pored over her portfolio, imagining how she’d translate her skill with movement and light to my action adventure story. Would she illustrate one of the set pieces from my characters’ adventures deep in the Earth? And if so, however were she and the folks at Harper going to decide amongst them? Turns out, they chose not to. 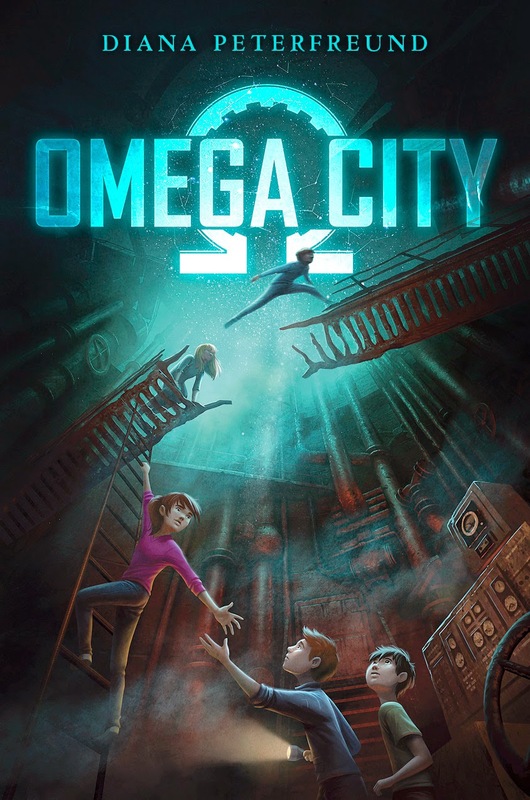 Instead, the image that appears on the cover of OMEGA CITY is an amalgamation of several moments in the book – the starry dome in the entrance chamber, the ladders inside the elevator shaft, the ancient computers of the Comm room, and the crumbling walkway to the rocketship Knowledge. All sorts of details and easter eggs lurk in this extraordinary image, and I get giddy with the thought of what readers will find when they flip back and look mid-story. Diana Peterfreund is the author of many books for adults and chidren, including the critically acclaimed For Darkness Shows the Stars and Across a Star-Swept Sea. She lives with her family outside Washington, D.C. in a house full of bookshelves, and is always on the lookout for lost cities and stray rocketships. 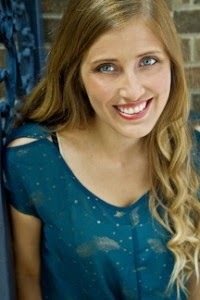 Find out more about Diana and her books at http://www.dianapeterfreund.com. Thanks to Diana for sharing OMEGA CITY's awesome cover on Kidliterati! Lovely cover, especially that crumbling walkway and you get the feel that they are trying to escape up the ladder. Thank you so much for hosting my cover reveal. I love it so much. I dig that there's so much going on in the scene and that the girls look capable and in charge. I don't need to read the blurb or see the cover--I just know I want to read this book! BUT the cover is fantastic (hooray for illustrated covers! ), and I love MG adventures (especially sci-fi adventures with a mystery twist). Looking forward to this one! This looks like a fabulous MG! I love the broken ladder across the stars. And the teamwork being displayed. Congrats to Diana! The gear in the omega though! I love it so much! Also the outlined constellations! It's so cool, I can't wait for this book. Vivenne To's work is so distinctive. I really enjoy her use of color to express emotion. This cover screams excitement.